Your participants may either use a desktop computer or mobile device, the website is fully responsive, and all features are available through any device (though with a slightly different design). After you have accepted a participant into your tournament (or have created him manually, using his Toornament Account email address), he will enjoy all the features and tools the platform has to offer, making your life an order of magnitudes easier! Participants will see your tournament, and all their matches in it, in ordered lists directly on the front pages. 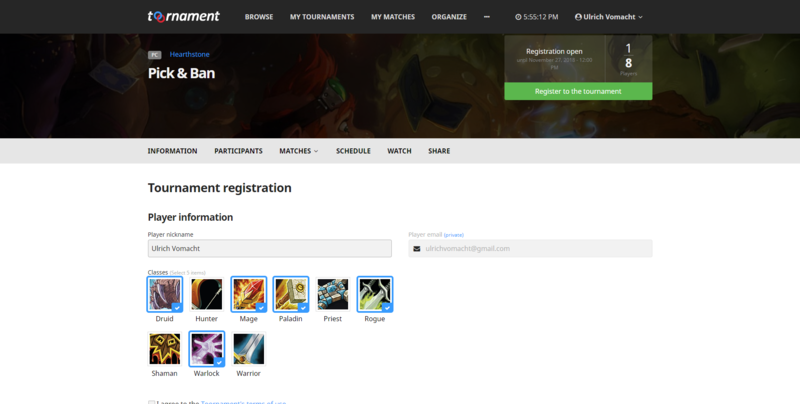 Features like the Hearthstone Pick & Ban, Krosmaga Pick & Ban or LOL Tournament Codes are directly available to participants with Toornament accounts! You can enable the Check-in, so participants have to confirm their presence before the tournament begins! Participants will also be able to report the results of their matches themselves, with scores, proof screenshots and notes. Participants also have access to match lobbies, to discuss with their opponents and/or you.